At the homebrew store, Max hands the employees another beer to try. Max: Here is another of our beers. Try that one! Homebrew store employee: Hey, this isn't bad! Pretty good! Homebrew store employee: Decent pale ale! Homebrew store employee: Thanks for bringing some good stuff! Homebrew store employee: We usually just get to the drink the customer's failed batches. 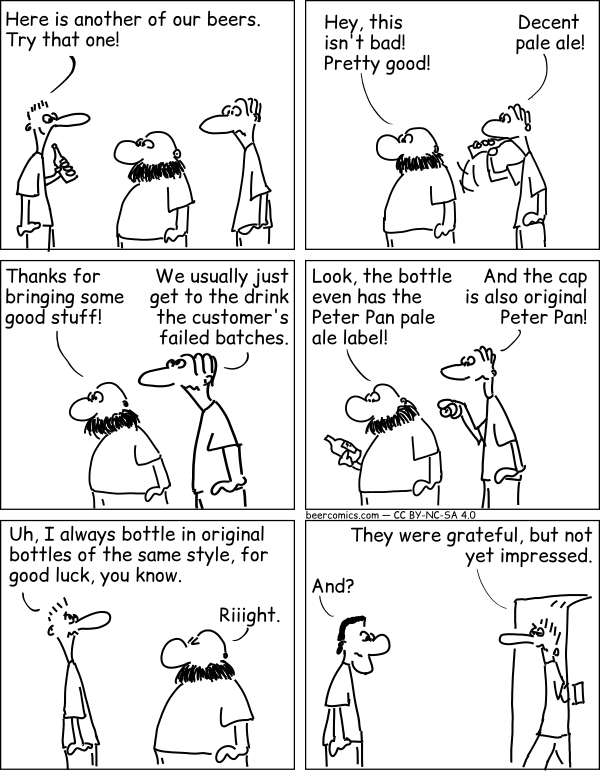 Homebrew store employee: Look, the bottle even has the Peter Pan pale ale label! Homebrew store employee: And the cap is also original Peter Pan! Max: Uh, I always bottle in original bottles of the same style, for good luck, you know. Max: They were grateful, but not yet impressed. Well made clone by Robert Wenner is licensed under a Creative Commons Attribution - NonCommercial - ShareAlike 4.0 International License. Permissions beyond the scope of this license may be available upon request at https://beercomics.com/imprint.html.